What Types of Data Does a Data-Management Platform Collect? Marketers and advertisers use a variety of platforms and applications, and while these tools improve campaigns and increase conversions, there is one major problem with using multiple tools: data is stored in too many different areas (or data silos). This multiple-silo situation means advertisers and marketers are unable to see the full potential of their customer data and turn that information into profitable results. Collect and combine all your customer data from a range of different sources. Segment your data into custom audiences. Use those custom audiences to improve media-buying, targeting, and retargeting campaigns. However, a DMP is not your only ally in collecting data. 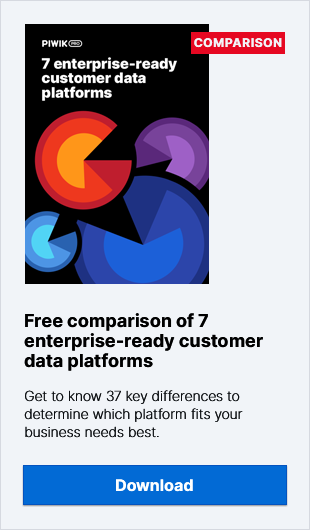 Consider its younger sister a customer data platform. Although primarily driven by first-party data it also gathers third-party ones enabling you to merge immense volumes of data scattered across various channels and sources. To be more precise, it collects analytics data from your apps and websites, but also helps you to gather data from CRMs and transactional systems. With all this data a CDP supports data analysis, campaign automation, cross-channel customer journey mapping and online advertising. Moreover, a CDP is managed by marketers. That means more independence from IT departments. What Types of Data Does a DMP Collect? There are three types of data a DMP collects — first-party, second-party, and third-party data. In the eyes of marketers and advertisers, first-party data is considered the most valuable because it is collected from people who have a direct relationship with the brand (i.e. customers or potential customers who have had some interaction with the brand). An example of first-party data would be analytics collected from a brand’s website. First-party data can come from online and offline sources (see the section below for more details). Brands and advertisers use this type of data to upsell products and services to existing customers and convert users into customers. Second-party data is sometimes referred to as partner data, as it is first-party information collected by one company and sold or traded to another. A typical partnership involves two non-competing companies with similar audiences. For example, a car-rental company could partner with an airline, buy or trade the airline’s first-party data, and use it to display ads to the airline’s customers. This type of partnership would greatly benefit the rental company, as renting a car, especially from an airport, is something a lot of airline passengers do. The partnership could be one-way (i.e. the car-rental company buys the airline’s first-party data), or it could be a data-trade deal where they share information with each other, therefore allowing the airline to display ads and messages to the rental company’s customers as well. While first-party data is more valuable, as it contains people who either are existing or customers or have expressed interest in becoming one, second-party data allows brands and advertisers to reach a new, untapped group of potential customers. In terms of value, third-party data comes in last place. It is neither collected from the brand nor advertiser, and it isn’t provided by a partner company either. However, third-party data still adds value to marketing and advertising campaigns. Prospecting involves advertising to someone who has never been to your site. As first-party data is collected directly from people who have already visited your site or interacted with your brand, it lacks the ability to reach new potential customers. Third-party data, on the other hand, allows marketers and advertisers to reach new potential customers on a much larger scale. Lookalike modeling uses third-party data to find and target people who look and behave like your best existing customers. For example, if your highest-converting users are males aged 30–40 who are interested in motorsports, third-party data can help you find people who match those criteria. Lookalike modeling is considered a new and more effective form of prospecting. Audience intelligence lets you compare your current audience and customers to third-party data to learn more about how people behave (e.g. identifying what makes them convert). Data from audience intelligence can help brands and advertisers optimize certain areas of their site and campaigns. Where Can You Obtain This Data? A data-management platform can collect data from your online and offline sources. As all of the above data is collected directly from the user, it is classified as first-party data. It’s important to note if a company collects small amounts of offline data (e.g. only email addresses), it is possible to just import the data into a DMP. For larger amounts of data containing different data sets, companies will need to onboard it (see the First-Party Data Onboarding section below). How Can a DMP Collect All This Data? Data collection is the first phase of DMP implementation and it is done in a few different ways depending on where your data is stored. Probably the simplest way for a DMP to collect first-party data from your websites is by adding tags, which are snippets of code inserted into a website’s pages, usually between the elements. Using a tag manager (like Piwik PRO Tag Manager) will help you easily create, deploy, and manage all your tags across all your websites. Related post: What are the Benefits of Using a Tag Manager? Cookie syncing is the process of mapping one user ID from one technology platform to another (e.g. from a DMP to a DSP). Most ad-tech platforms use the cookie-syncing process to share and collect information, including data-management platforms (DMPs), demand-side platforms (DSPs), ad networks, ad exchanges, supply-side platforms (SSPs), and many more. Related post: What is Cookie Syncing and How Does it Work? If a company collects both offline and online data, they can use first-party data onboarding for integration. The general process involves a company uploading offline data with an onboarding platform (like LiveRamp, neustar, or iBehavior), putting it through a process known as hashing to anonymize the data and remove any personally identifiable information (PII) (e.g. email addresses, names, physical addresses, etc. ), and matching the offline data with the company’s online data. Related post: What is First-Party Data Onboarding and How Does it Work? APIs are used to exchange data between web servers and a DMP. This type of data exchange is ideal for companies that have a number of data silos (places where their data is stored).